People have been planting potatoes for thousands of years. Not surprisingly, in that amount of time, the cultivation of everybody's favorite tuber has become a bit of a science. Fortunately, potatoes are among the most forgiving plants in the vegetable garden. Before you know it, you will be digging in those hills to find the first tender little nugget-sized spuds. Old kitchen potatoes, and even sprouted peelings in the compost, have produced a good many potato crops. The only problem with this method is that commercial kitchen potatoes are sometimes treated with sprout inhibitors to prolong shelf life. Resistance to sprouting might be an advantage for the potatoes in your pantry, but not in your garden. For this reason, many gardeners prefer to use certified seed stock potatoes or a combination certified seed stock and leftover kitchen potatoes. To speed emergence, keep seed potatoes in a dark, dry, warm, room for a week or two before planting. By the time you are ready to plant, they should be just beginning to sprout. Those potatoes that have not yet sprouted or are showing signs of rot should be discarded, as they are unlikely to do well in the garden. If you are planting an early crop, use only small, whole potatoes. Cut potatoes will normally do fine when planted later in the season, but in cold soil they have a tendency to rot. Choose a site with slightly acidic, nutrient-rich soil. Ideally, rotate crops so that potatoes and their relatives, such as peppers, tomatoes, and eggplants, are not grown in the same location two years in a row. Potatoes can usually tolerate a bit of frost, and the main stems and leaves will not usually emerge for the first week or two that they are in the ground. For this reason, planting potatoes is generally safe as early as 10 to 14 days before the last frost. For example, if you need 50 lbs of potatoes to last through the winter, expect to plant about 20 feet (6m) of rows, using about two pounds of seed potatoes. Corn: Potatoes are a cool weather crop. While a little sun is good, elevated internal leaf temperature can actually impede photosynthesis. Alternating double rows of potatoes and corn will shade the potatoes just enough to prevent overheating, while still allowing enough light through for optimum growth. As both species are heavy feeders, be sure that the soil is rich in nutrients and organic matter to prevent competition for resources. Horseradish: A 2009 study supported what grandmothers have been saying about horseradish for years. It seems that certain ingredients in the roots of horseradish create an inhospitable environment for the growth of the bacterium responsible for potato scab, making horseradish an excellent companion plant for the prevention of this disease. Choose small seed potatoes, ideally two to three ounces (55-85g) in weight. 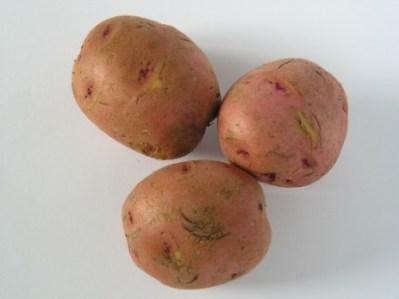 Cut larger potatoes into chunks before planting, with each piece having at least three 'eyes' beginning to sprout. Allow the pieces to dry for about a day to form a callous on the cut sides. This reduces the likelihood of bacteria and other pathogens invading the flesh of the seed potato. Dig long trenches or individual holes about ten to 12 inches (25-30 cm) deep. The soil around the planting site should be well worked and loose to allow maximum room for growing tubers to expand. Sprinkle a small handful of bone meal into each growing site. Bone meal is rich in phosphorus, which is necessary for good root and tuber development. Place one seed potato or chunk every 12 to 14 inches (30-35 cm.) Planting potatoes closer together will result in smaller potatoes. Cover the newly planted potatoes with a loose layer of soil and water well. As your potatoes are growing, you can hill them every week or two by using a garden rake or hoe to push some soil up against the base of the plant. Keep your potatoes well-watered and sprinkle an occasional handful of bone meal on the top of the row. In no time at all, your humble little seed potatoes will produce a bumper crop of spuds ready for winter storage.